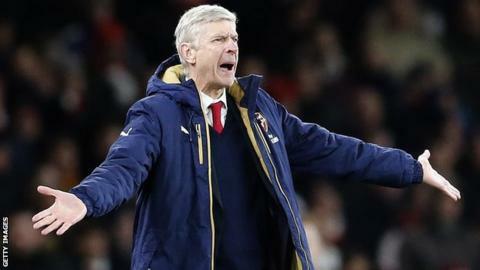 Manager Arsene Wenger is "worried" about Arsenal's recent results and says his players need to get back to "basics" after a 2-1 loss to Swansea. Mauricio Pochettino, meanwhile, refuses to blame nerves as his title-chasing Tottenham side lose 1-0 at West Ham. And Manchester City's Manuel Pellegrini says he is not thinking about the title after watching his side crash to a 3-0 defeat against Liverpool at Anfield. It all means Leicester remain top of the table, with just 10 games left. The Foxes have 57 points, extending their lead in the latest round of games thanks to Tuesday's 2-2 draw at West Brom. Fate, romance, the perfect farewell? Who wins the craziest Premier League? BBC 5 live podcast: Does anyone want to win the title? Position: Third Played: 28 Points: 51. Defeat at home by Swansea means Arsenal have lost three games in a row for the first time since 2010. After Ashley Williams scored a late winner for the Welsh side, Wenger said his side's loss of form "looks a bit" like a confidence issue. "I am worrying about our results," he said. "We don't dream. We have to be realistic and come back to what we do well... the basics. "The players are very down but we have to respond. We have to focus on our job and remind ourselves that we have some quality as well." The Match of the Day pundit says Arsenal's problems are nothing new. "There is a lack of fight, lack of leadership," he said. "The same questions are hanging over them. Arsenal's issues have been repeated over and over." Spurs had the chance to top the table in the month of March for the first time since 1964 but looked a shadow of the side who had won six successive league games. "Was it nerves? No," said Pochettino. "I think we made some mistakes that we normally don't make. "We started badly, conceded a goal and West Ham played better than us. We were poor. But the way the players fought in the second half was fantastic. "We are very disappointed. The Premier League is very competitive, with no easy games. You need to be 100% mentally and physically." The Match of the Day pundit says the Hammers deserved their victory. "Spurs lacked energy, they had no spark, their passing was poor," he said. "West Ham were dominant all game. They overpowered Spurs." Three days after their League Cup final win over Liverpool, City managed just four shots and ran 106km compared to the Reds' 115km. "I could see the team was not recovered from the last week," says Pellegrini. "We played in the Champions League and League Cup final. "I said always the team that wins title will be less than 80 points. I am not thinking about the title but to recover our performance." The Match of the Day pundit says he was shocked City were defeated so convincingly. "City were sloppy, they did look tired," he said. "Fernando was the only player who kept going. The others gave up far too easily." Arsenal, Spurs and Man City may have lost, but it was a good night for Manchester United and their manager, Louis van Gaal. United are now level on points with fourth-placed Manchester City after a 1-0 home win over Watford. "I have to give big compliments to our players because when it is physical and you can win at an important moment, when all our competitors are losing, it's very important," said Van Gaal. "That's the Premier League, the difference between clubs is so small. You can lose against every opponent, I think. "We lost against Sunderland and there was a lot of criticism but now you see we are closer to the fourth position, so now we are fighting for it." The Match of the Day pundit says he is amazed United are level on points with City after all the issues they have had. "Watford caused them all sorts of problems and they could have been in big trouble," he said. "None of us can predict what's going to happen." Who wins the craziest Premier League? Read more on Premier League: Fate, romance, the perfect farewell? Who wins the title?